I remember what I ordered the first time I ever went to a Thai restaurant and that is still one of my top appetizers and entrees to this day. I had Basil Rolls and Pad Thai! I had never before tasted the wonderful combination of flavors that bursted out of the Basil rolls with peanut sauce….next time I went I ordered basil rolls and a cup of coconut soup…that was enough for my dinner….The Massaman is another favorite of mine and I always have a hard time choosing t new dish when I go out and eat Thai food. The best thing is if we are a couple of people and we all order different entrees and appetizers and we can share… I like the stuffed dumplings and chicken with peanut sauce. 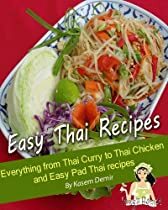 This recipe book contains all of the dishes mentioned above of course and some other ones that are high up on my list. Hope you will enjoy them too! !